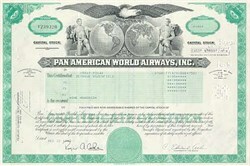 Beautiful engraved stock certificate in mint condition from the now defunct (again) Pan American World Airways issued prior to 1981. The vignette shows 2 partially clothed men holding the two globes topped by an eagle. The name Pan Am is truly synonomous with aviation. For over 60 years it pioneered transocean and intercontinental flying. It was the launch platform for aircraft types that set the standard by which all that came later were to be measured. For a period, as the quasi-official "Chosen Instrument", it represented America's commercial aviation policy overseas (and some would even claim it's foreign policy). Without Pan American the world's air transport would surely be different, and even the destinies of some nations would be changed. Pan American World Airways began life in 1927 with a vision, some single engine aircraft and a single route from Key West to Havana. From this beginning came the airline that would literally open the world to aviation. Pan Am launched more new aircraft development than any other airline in history. It pioneered routes across the world's oceans and continents, eventually operating daily flights circling the globe. Then, in 1991 after 64 years of pioneering, Pan Am finally sucumbed to years of crushing financial pressures. Pan Am almost didn't happen Early commercial aviation in the United States was driven by exclusive Air Mail contracts tendered by the Post Office. Juan Trippe, Pan Am's founder, had received the contract for US-Cuba mail service and in order to hold this crucial Air Mail contract, Pan Am had to fly the Key West-Havana mail route no later than October 19, 1927. Unfortunately, the selected aircraft, a Fokker F-7 was not even due to be delivered until September 30th. And, Meacham Field, the new airfield at Key West, was not ready either. But, fate stepped in, as it often did with Pan Am, when it was learned that a single engine Fairchild belonging to West Indian Aerial Express of the Dominican Republic was in Key West awaiting word on a possible hurricane in the Caribbean. For the modest sum of $145.50 this aircraft was chartered by Pan American to fly the mail to Havana. And Pan Am was off and running. Key West lays claim to the original home of Pan Am, but it was chosen primarily because it was within the practical operating range of the aircraft of the day. With the eventual arrival of the longer range Fokker F-10 Trimotors, Key West's location no longer served an overriding need and the company's operations were moved to Miami. A Mexican Adventure In July, 1921 Compania Mexicana de Transportacion (CMTA) was established by two Americans living in Mexico. Originally intended to fly a route from Mexico City to the US border, the owners soon realized that a much more lucrative use was to serve the new oil fields around Tampico. The booming oil business soon spawned other airlines, including Compania Mexicana de Aviation (CMA), now known as Mexicana, which eventually purchased CMTA. In January 1929, the US Post Office advertised for bids on a foreign air mail contract from the US to Mexico City. Pan American was the successful bidder and immediately proceeded to purchase the entire assets of Mexicana. Around the Caribbean Additional growth came in the Caribbean through the winning of other Post Office mail contracts. Early 1929 saw additional routes throught Cuba and Hispaniola to Puerto Rico. At the same time, in Central America, routes were being extended from Mexico to Panama. Later in 1929, routes were added to Cartagena and Mariacaibo in South America, and the islands as far south as Port-of-Spain and to then to Paramaribo. The Caribbean loop was closed in 1930 and 1931 with the addition of routes to Curacao and Maracay. Early route surveys of this area had been conducted for Pan Am by Charles Lindbergh. Although Lindbergh favored landplanes, it was clear to him that amphibians were better suited to the undeveloped nature of the region. Trippe contracted Igor Sikorsky for a number of the as yet unproven S-38, a twin engine 8 seat aircraft. Eventually, Pan American would operate 38 of these airplanes, either directly or through subsidiaries in Latin America and China. The Pan American Grace Era The shortest route to Buenos Aires, Trippe's ultimate objective in South America, was down the west coast. But the way was blocked by the W.R. Grace Corporation, a powerful American trading company operating from Panama to Santiago. Grace's power often rivaled, and may have exceeded, the power of many of the governments where it operated. So Trippe tried to outflank Grace by creating or acquiring new rights. Trippe acquired a half-interest in Peruvian Airways, conveniently established just 12 days earlier by an American owned aerial crop dusting firm that had already acquired Peruvian air traffic rights. Several months later, the permits were fully acquired by Trippe. To further pressure Grace, toward the end of December, 1928, Chilean Airways was founded but never operated. The combination of Peruvian and Chilean air rights soon pressured Grace to compromise and in January, 1929 Pan American-Grace Corporation (PANAGRA) was organized. The New York, Rio and Buenos Aires Line (NYRBA) was organized in 1929 to operate the east coast of South America. Minor operations were conducted in 1929, but the grand inaugual was in February, 1930. Using the graceful Consolidated Commodore, a sleek, 22 seat flying boat with a range of 1000 miles, NYRBA launched it's first major Argentine mail contract flight from Buenos Aires to Miami. However, the real money was in the lucrative US Air Mail contracts, and NYRBA was grooming itself to win those. But, that was not to be. Confident that Pan American would receive the US Mail contracts, Trippe made a hostile takeover bid for NYRBA in late 1930. In fact, Trippe was so certain of his position he even listed the sought after mail contract as a Pan American asset when negotiating the merger! The merger was completed on September 15, 1930 and, true to form, nine days later Pan American was awarded the US Mail contract for the east coast of South America. Some Strange Colombian Dealings In 1919 a group of German and Colombian businessmen had created Sociadad Colombo-Alemana de Transportes Aereos (SCADTA). SCADTA quickly opened service from Barranquilla to Bogota and went on to rapidly add additional domestic service. Aided by the export ambitions of the German aircraft industy, it quickly expanded into international operations and soon found itself operating into Cristobal in the Panama Canal Zone and Guayaquil. SCDTA even dispatched a mission to the US to investigate opening a trans-Caribbean service linking North and South America. All of this presented Trippe with clear problems. He had recently negotiated the PANAGRA deal and now found himself face to face with another growing airline in his path. Colombia and the US had negotiated an aviation treaty, but it gave the new PANAGRA little more than overflight privileges. So, Trippe resorted to the method that had worked so well with Grace -- he created La Sociedad Anonima Colombo-America de Aviacion as a thinly veiled threat. With this he approached the German owner of SCADTA, whom he knew was in serious financial difficulty after the Wall Street Crash. The result was an unpublicized "gentleman's agreement" by which Pan American acquired the majority interest in SCADTA. SCADTA quickly halted operations at Cristobal and in Ecudaor, thus giving PANAGRA free rein. Pan American's presence was also quickly felt in the internal operations of SCADTA, not necessarily to their detriment. The Pan Am presence brought with it more modern Sikorsky, Ford and Boeing aircraft. And there were significant traffic advantages to being part of the Pan American-PANAGRA network. As a result, SCADTA prospered, probably far more than it could have otherwise. But all of this was not without eventual problems. As World War II broke out in Europe, the US was nervous about a German-owned airline (even at this time the "gentlemen's agreement" was still undisclosed) operating so close to the Panama Canal. Under pressure from the US, Colombia began looking more closely at SCADTA. When the President of Colombia found out about the secret agreement with Trippe, SCADTA was nationalized and merged with another Colombian airline, SACO. The resulting new company, AVIANCA, because of its roots in SCADTA, can lay claim to being the oldest airline in the Western Hemisphere. But, in spite of the scandal over the secret agreement, Trippe once again landed on his feet -- Pan American ended up with 64% of the stock in the new AVIANCA, and continued to supply aircraft and operating expertise to it for many years after the war. An Atlantic Opening In July 1931, Boston-Maine Airways began operating a mail route from Boston to Halifax. Boston-Maine was created by the Maine Central and Boston and Maine Railroads but operated under contract by Pan American. This was an ideal situation for Trippe. Not only did his company gain additional operating experience in northern climates, headed in a direction he wanted to go anyway, but he got paid for it as well. Shortly after service began, Trippe signaled his intentions when he sent a letter to the major aircraft manufacturers seeking a "high speed multi-motor flying boat having a cruising range of 2500 miles against 30-mile headwinds, and providing accomodations for a crew of four, together with at least 300 pounds of mail". The door to the Atlantic was opening. Throughout its life, Pan Am was a pioneer. Most of the services and technology that we take for granted in the aviation industry find their roots in Pan Am. Pan Am built airports, established air navigation systems, trained local nationals, etc., wherever it went. This is a partial list of some of Pan Am's "firsts" and the dates that Pan Am started service in many cities around the world.